Outlook's design mimics a daily planner with Email. Within the computer program lies a daily task manager, a scheduling calendar, a list of friends or contacts, and serves as an inbox to one or many email accounts. Additionally Outlook bridges the gap between Excel spreadsheets, Access databases, and Word documents. Outlook is sort of an all-in-one program with a little of everything. 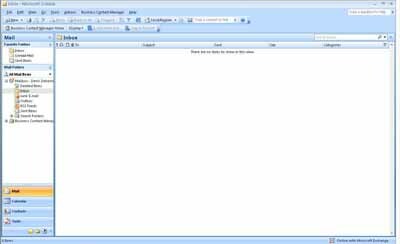 Outlook express includes just under half of the capabilities of Outlook. Outlook Express is included free with most Microsoft operating systems offering convenient email solutions, limited contacting capability, and a few other odd and end web features. Though the names are easily confused, once you are familiar with Outlook you will be forever greatful of the full featured Outlook program. Installation is a breeze if you are running newer versions of Microsoft's Windows. Insert the installation disk, run the setup file (should be included in the disk documentation), and then point the installation program to a directory on your hard disk. Starting outlook yields entirely different results. Usually there are several pop-up windows prompting you to set up an email account, or asking if you want to import data from other office programs such as Outlook Express. If you have used Outlook Express previously, go ahead and import your contact listings and email by the way. If you have not, feel free to cancel or skip these stages, as we will be diving into them in later lessons. The next few pages are designed to familiarize those individuals that have had zero experience with the Outlook program. We will be covering the icons at the top as well as the menu. The goal is to become familiar with the program enough so that we can dive into advanced walk-throughs and tutorials. Grab a beverage, sit back and enjoy.